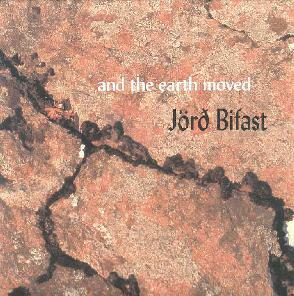 Jörd Bifast - "And The Earth Moved"
Bifast is percussion-master extraordinaire Steve Hubback’s second project — a lovely, gong and wind chime rich ambient mix, a three-man outfit recorded in Reykjavik in the summer of 2000, full of his signature sonic trademarks, the only exception to this being ‘The Fire Sermon’ a Fripp-esque guitar piece: dark, ominous with a mid-song break in the percussion line — courtesy of Hubback’s fantastical sculptures — the term ‘sound sculpture’ is totally appropriate, as the interplay between the visual and the aural is rarely so tight. With guitarist Egill Johannsson and atmosphere and live sound technician Siggi Hrellir, Bifast carve out chilly, precise compositions, lovely like the purest of blue ice, and its fitting that this show should have been recorded in that arctic, Danish-speaking land. This is music by, from and for the earth, an homage to spirits and natural phenomena like the moon, wind and the earth. The mass of crenulated rock which rises behind the group in Bifast’s cover art attests to sparing yet brilliant depiction of brute natural forces. For those curious to investigate the phenomenon that is Steve Hubback (and a nice shots of his various bands), visit http://www.dse.nl/hubgong. The site is full of metalwork shots (gongs, wind chimes, candlesticks, body art) as well as performance dates and interesting links. Enjoy!